Crosby is an American singer, guitarist and songwriter. 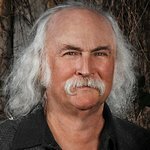 Crosby is a two-time Rock and Roll Hall of Famer, inducted with The Byrds and Crosby, Stills and Nash; he is also in the Songwriters Hall of Fame. In addition to his solo work, Crosby still tours and records with CSN, CSN&Y, and as a duo with Graham Nash. Google trends for "David Crosby"
We don't have any videos related to David Crosby.